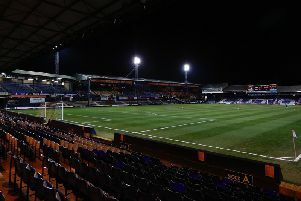 Although it came in a losing cause, Luton striker Elliot Lee was satisfied to reach double figures for the first time in his career against Accrington on Saturday. The former West Ham frontman’s previous highest tally during his five seasons as a pro was three in the 2014-15 and 2015-16 campaigns. I think I’ve got quite a good goals to game ratio, so I’m happy with that. However, when he took Jack Stacey’s searching pass, cut inside and slotted through the legs of Aaron Chapman, it saw him join Danny Hylton and James Collins in reaching the first milestone all strikers aim for when the season gets underway. Lee, who has now made 30 appearances for the club this season, said: “I’m really pleased with that, as I think I’ve got quite a good goals to game ratio, so I’m happy with that. On the goal itself, Lee was quick to praise Town’s energetic full back for not only having the vision to pick him out, but also the power to deliver the 70-yard crossfield pass. He continued: “I just tried to get some space on the other side and credit to Stacey, it’s a great pass and it’s a massive switch. “I don’t think I could kick it that far! Lee could have reached 10 a lot quicker had he not suffered a frustrating setback after notching his double against Wycombe at the end of January, out for six weeks with a shoulder injury. He said: “It’s been a frustrating six weeks, because the shoulder feels all right, it’s just some contact things. “I’ve been training with the boys for about two or three weeks now and it was great to be back out there, and I’m just disappointed we didn’t get the win. “I’m really pleased to be playing upfront again with Hylts (Danny Hylton) too. “I don’t think I’m at my full sharpness as it’s been three or four weeks out.